Originally posted on June 23, 2015. Now updated with my complete list of 2015 reads. I used to be a prolific recreational reader. Two rounds of grad school zapped a bit of the joy out of reading. So, over the last couple of years I spent more time entertaining myself than I did educating myself. I watched a lot of sports, a lot of television and many movies. Sure, I still read here and there, but I wasn’t finding joy in learning. In fact, I was hiding from it. After taking that regrettable, but seemingly needed hiatus from reading, I decided 2015 would be the hear to hop back on the wagon. My wife and I went through a fairly rigorous goal setting session this past winter and both came up with a few things we wanted to do in 2015. I wanted to cut down on my media consumption and return to the life of a prolific reader. So, I set a goal. It felt really lofty at the time, but that’s my personality. I run, but I run marathons. I race triathlon, but I race Ironman. You get the picture. So, I decided on 100 books for 2015. Maybe that’s not that many for some of you, but just about 2 a week was a huge improvement from the 1 every month or two of the previous year. I figure a roughly 1,000% improvement was lofty enough. Well, I’m on track. I’ve knocked down 56 books since January of this year *now 84 as of 10/26). More than the volume of books has been the changes I’ve noticed. I’m different. My conversations are different. My wife and I have far more interesting discussions. My ideas are brighter. I’m more forward looking. There’s always something different to talk about with others. I’d been missing so much. In short, my life is more interesting. I tend to read down the rabbit hole. Meaning, if I like a book I take note of every book they reference and check it out at the library immediately so it’s in my que before I forget. I predominantly read non-fiction with an occasional piece of classic fiction thrown in. Non-fiction stretches me in so many areas of my life. I’m challenged with new ideas about business, career, faith, marriage, health, finance, etc. Here’s the list of what I’ve read so far this year (in chronological order). I’ve highlighted a few of my favorites and added a blurb for some. If you can, read a few of them. If not, turn off the TV and at least read something, learn something (and no, social media doesn’t count). You will not only like much of what you learn, but you’ll like the changes that come with reading. Let me know what you’re reading (non-fiction please). I can always use a good recommendation. I can read anything Seth Godin writes and find myself better off for doing so. But, this was the first book of his I read and it’s remarkable. It challenged the way I view the world, how I see myself and how I see opportunities. It challenged me to step up and speak up. It’s a very creative read that will challenge how you see yourself and what you do. Highly recommend it! Brene Brown is gifted! I was introduced to her through her book Daring Greatly last year. It’s phenomenal. Her work on facing shame is powerful. She has an incredible ability to communicate technical research in a way that very few researchers are able. The title of the books explains the content. Move away from worrying about how you’re viewed and life into who you are. I work in real estate investment. I’ve been around Wall Street guys for the past several years, but have only really understood the real estate side of things. This book does a good job explaining an investment strategy that’s easy to understand and built off some of the basics of classic investor Benjamin Graham. A very short read. Easy to digest in an hour or two. Godin does a phenomenal job describing the life cycle of any opportunity, project, career and builds a framework to aid in deciding when to hold your course or when to change it. If you’re struggling to decide if you’re work is right for you this is a book that will help you develop clarity and a strategy for moving forward in whatever direction you choose. Just read it. You’ll be glad you did. This may be one of Godin’s best! He covers so much. He challenges the educational system, pushes the reader beyond living as a cog in a wheel, encourages making yourself indispensable in your work and challenges your mentality. I walked away from this book encouraged to grow in my career and in my continual education. The book speaks for itself. Highly recommended. Sign up to receive his daily blog here. Gatto did a fantastic job summarizing the history of education. He bucks the system and the system needs to be bucked. Public education as we know it was designed to build factory workers not creative thinkers, entrepreneurs and change makers. Don’t believe me, read this and you will. You’ll rethink your educational history, the path you have for your children and wonder how you can begin to learn anew. Warren Berger wrote an amazing book. He hones in on the power of inquiry as compared to our predilection for advocacy. He centers his entire book about asking three questions: Why, What if and How. It’s a powerful model to spark new ideas, new lenses through which to see your personal and professional life. I can’t imagine you’d regret reading this unless you just prefer teen adventure novels based on dystopian societies. Please read this. To Sell Is Human: The Surprising Truth About Moving Others – Daniel Pink. My mentor suggested this one (along with many of the others), but it’s not one that would have hit my radar otherwise. What a book! It helped me to think through what I view as essential and how I can truly focus my time, energy and life around one priority at a time. It is not just a book on simplicity, but on pursuing less and finding how much more comes with it. There is wonderful freedom in simplicity. Decisions making is a clearer process when you have a better understanding of what’s essential to your life. The Heath brothers knocked it out of the park with this one. They did a wonderful job developing a framework for managing change. They discuss how to best utilize our rational and emotional natures. This book cleared up so much for me and how I deal with change. It helped me to better understand how my rationale can only get me so far managing underlying emotions before things halt. By understanding things through their framework I’m better able to not only face change, but to excel in it. This book offers valuable insights for all aspects of your life and how best to tailor aspects of your environment to get where you want to go. 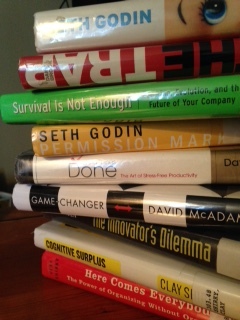 If you can’t tell by now, I’m a big Seth Godin fan. I read his blog daily and most anything he puts out. Check him out. Linchpin and What To Do When It’s Your Turn are great places to start. If you like candy, this is a fun education on its history and one candy freak’s experience in learning about it. An interesting insight into the 2008 financial crisis. This is an excellent book. Bonus points if you can figure out how to pronounce the author’s last name. The book will help you better understand what it means to be in your sweet spot. This book offers quite the education into the simplicity of index investing, the matter and impact of fees in your portfolio and provides alternatives to the typical commission based product focused investing of many firms. My count shows 104 books read for 2015. 2016 is well under way and I went after the same challenge. Update to follow shortly. ………………..thank you!!! Keep it coming!